Water, application costs and incorrect irrigation cost you money. Over-irrigation can have as large a negative effect on crop yield and quality as under-irrigation. Neither under or over irrigation are economically or environmentally sustainable. 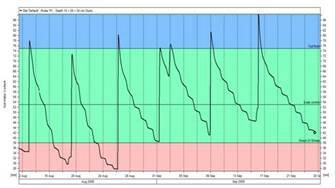 How do you schedule your irrigation? 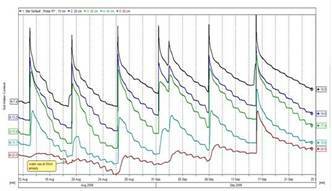 There are many ways to schedule irrigation water balance sheets, neutron probes, tensiometers, the boot! Some pros and cons for different systems can be found below. Good decisions require good data. 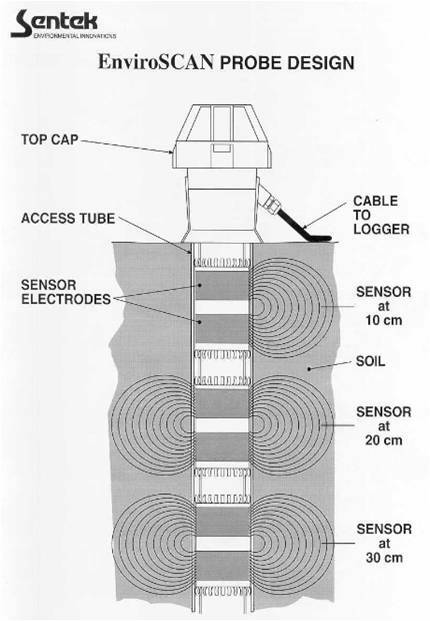 With many years of experience using all these technologies our preferred method is to use EnviroSCAN™ probes which accurately and continuously monitor soil moisture changes at multiple depths. What does poorly timed, under or over irrigation cost you? Crops need water to thrive. Soils/substrate act as a reservoir for the crop to draw on, the size of the reservoir depends on the plant root depth and soil type. Would using cost effective in field monitoring equipment help you improve? Our experiences with our existing clients suggests it almost certainly will. Read some of our case studies and then contact us to discuss a trial system. The surface gives no real indication of how much water is really available to the crop. The surface can be bone dry over a soil with plenty of water or be wet following recent rain/ irrigation that has only penetrated a few centimeters. At least use a spade. Can cover large areas. These make many assumptions about field capacity and use ET (Evapotranspiration) figures which often do not relate to what actually happens in your crop. Balance sheets and models can serve a useful purpose but having a few probes to monitor actual data and feed corrections in can greatly improve their accuracy. Require licensed contractors due to the radioactive nature. Manual readings are labour intensive and only provide a snap shot reading of one point in time. Cheap, but from our experience provide unreliable data, are difficult to install and easy to break. You require several in order to monitor multiple depths.